Have you ever wondered why candy is so colorful? It's not just to catch your eye, it's also a tactical effort to copy off of mother nature. Our brains have been conditioned for thousands of years to know what colors to look for in nature for a sweet treat; but today many manufacturers use this against us and artificially dye their products to mimic our body's favorite natural foods. But mother nature did it first, and did it right—everything you need to satisfy your cravings can be found from the earth, and will give your body a boost of nutrients to boot. Here's a simple cheat sheet of what different colored foods mean for your body, and how to color coordinate your plate to make sure you're covering all your bases. Think of red foods, like strawberries, raspberries, and tomatoes, as your body's fighters. They're known for their antioxidant powers that protect your cells from damage and keep your heart healthy (thanks to a substance called anthocyanin). They can also help reduce your risk to multiple types of cancer (and are clinically linked to reducing prostate cancer) thanks to their pigment-producing nutrient called lycopene. 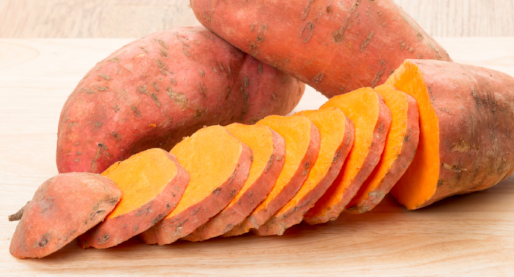 Orange and yellow foods, like sweet potatoes, pumpkins, and carrots, are your organs best friends. They contain carotenoids, which are amazing for your heart, and could reduce a person's risk for a heart attack by up to 36%. They also contain beta-carotene, which your body converts to Vitamin A. Vitamin A is responsible for maintaining the health of our eyes, so adding carrots to your meals can keep you looking sharp. There's a reason green foods are praised by the masses for their health superpowers. Green veggies like broccoli and cabbage can help protect our bodies from cancer (thanks to a nutrient called indole). And dark leafy greens have lutein, a type of carotenoid that helps with the health of your eyes. Green veggies are also important if you're pregnant because of the B vitamin folate, which helps reduce the risk of birth defects. Blue and purple foods make excellent antioxidants thanks to their supply of anthocyanins, which protect our body's cells from damage. These nutrient packed foods can also help reduce the risk of cancer, stroke, and heart disease. Certain blue foods, like blueberries, have also been shown to help with the aging process and improve people's memory. White fruits and vegetables can help lower cholesterol and blood pressure, and may even reduce the risk of stomach cancer and heart disease thanks to their supply of allicin. White foods like bananas and potatoes are also a good source of potassium, an electrolyte that is important for maintaining the balance of acids and bases in the body. I always aim to keep my plates and smoothies full of richly colored foods to keep my body nourished. 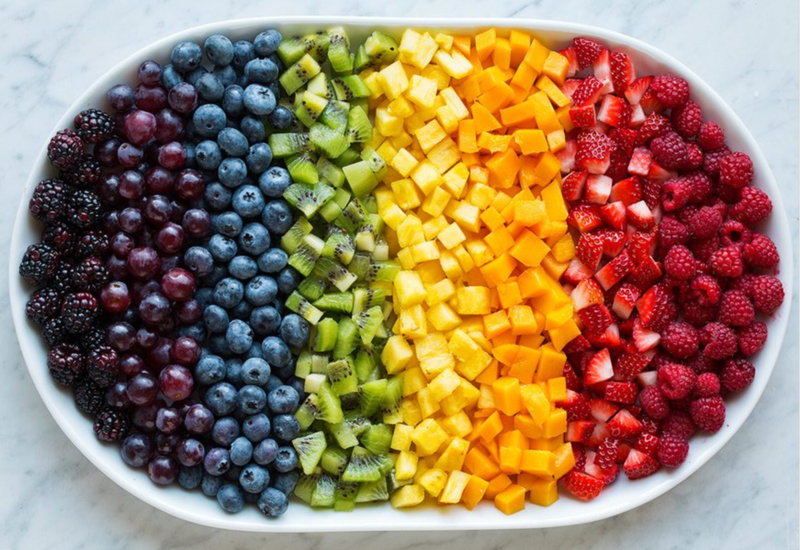 If we pay attention to the colors of the rainbow and incorporate as many natural colors as we can, we can allow our food be our body's medicine and be proactive about preventing problems before they start.